One of the first questions I'm asked about how to make compost by the beginner gardening enthusiast is "how much odor will it give off?" 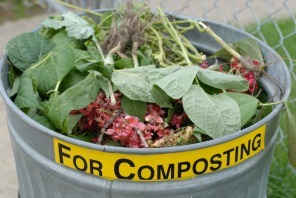 If you do it right, your compost will be odorless. Well, that's not quite true...When your compost has completed its final cycle, it will have a wonderful spring garden aroma. Take just one sniff and you can't wait to get out in your vegetable garden and start planting vegetables. Now that is not to say that your compost can't give off a bad odor. If you don't make your compost properly it will indeed give off an unpleasant smell. But then...That brings us to the subject of how to make compost. Put quite simply, making compost involves mixing yard and household organic waste together in some sort of bin or container that will encourage decomposition. What makes the difference between good compost fertilizer instead of a pile of smelly slimy material is how we go about it. A compost pile can be as simple as placing a pile of kitchen scraps and organic yard material somewhere in your yard and let nature take its course. If you have time and I mean lots lots of time, you will eventually end up with good rich compost. Nature has been doing this process for millennia. An ideal size for your compost bin or container that you make or purchase should hold approximately 27 cubic feet of organic material. This would be a size of 3 feet x 3 feet x 3 feet. To make a larger amount of compost, your container can be as large as 5 feet x 5 feet x 5 feet or 125 cubic feet. A size smaller than 27 cubic feet takes longer for the process to work, and larger than 125 cubic feet the compost pile will be too heavy for most people to turn. You might ask what organic material is nitrogen, and what material is carbon? An easy way to remember the difference is to think of two colors, green and brown. Green organic material has nitrogen and brown organic material has carbon. Hence, your kitchen for green material, and your garden for brown organic material. Kitchen scraps left over from preparing dinner are a great source for nitrogen. These items are fruit, rind, discarded peel such as potato or banana peel, coffee grounds, tea grounds, even seaweed. Yes, I know coffee and tea grounds are not green, however I include both as they are found in your kitchen and are rich in nitrogen. While I'm at it, another source of nitrogen organic material not found in your kitchen but instead in your garden is fresh grass clipping and fresh leaves. That is, while they are still green. Speaking about your garden, this is where we will find a lot of brown or carbon organic material such as dead leaves, dried grass clippings, twigs (shred these to a small size), hay, straw, and dead plants. Be sure not to use dead plants that are sprayed with insecticide and plants that are diseased. Making Compost Tip- Peanut shells, shredded cardboard, and newspaper are also a great source of carbon organic material. It takes longer for the brown organic carbon material to break down, so be sure to reduce its size by shredding the larger items. You can shred large items such as twigs with a pruning tool or use your lawnmower. Items to avoid include meat, fish, poultry (including bones), fats, grease, oils, dairy products, food sauces, as well as any other fatty food found in your kitchen. Also, avoid using manufactured products such as plastic, metal, glass, and waxy material. Now that we know what organic material we need, let's discuss how to make compost. When starting a compost pile do so in layers. Begin by adding slightly damp brown or carbon material to the bottom of the compost bin first. Because this layer is a bulky material, as it settles it tends to allow more air circulation between the material which is necessary for composting. Follow by adding a layer of green or nitrogen organic material. Continue by adding another layer of brown material and then you guessed correctly, another layer of green organic material. Repeat this process until you have about six to eight inches of organic material in your bin, but you don't have to be exact in your measurements. Also, try and make your mix of kitchen scraps and yard material a 3:1 ratio of carbon (brown material) to nitrogen (green material). Separate your layers by adding an inch or so of good garden soil which is rich in microorganisms (bacteria) which break down or decompose your compost pile. Avoid using soil that has been treated with insecticides or potting soil that is sterile. Wait approximately two weeks for your compost pile to start generating the heat necessary to promote bacterial activity. As the pile heats up and bacteria begins to do its work, turn the pile (a pitch fork makes a great tool). When turning your compost, make sure the material in the center is moved to the outside of your bin and the organic material on the outside is brought to the center. Continue adding more organic material using this layer technique turning the compost about every four to five weeks. If it seems the pile is getting really high and unwieldy, turn your pile again. Nothing is etched in stone, in this case don't wait four or five weeks and end up with back strain. The process of layering organic material and turning the mixture speeds up the decomposition process creating a quicker finished product. To better understand why we are doing what we're doing when making compost, let me briefly explain how composting works. For compost to break-down and give us the desired result, four things must happen. The compost must need moisture, bacteria, air (which gives it oxygen), and of course organic matter (rich in nitrogen and carbon). We have satisfied three of these four requirements already. 1.) We have chosen the correct organic material. 2.) We discussed mixing the compost pile which adds the oxygen needed through air circulation. 3.) We separate each layer with top soil or garden soil that is rich in microorganisms (bacteria) that will break-down or decompose your compost pile. What remains not covered is the fourth requirement needed for making compost and that is moisture. This is not usually a problem with green organic material because most if not all retain moisture. On the other hand, brown organic material is almost always dry (unless you collect it on a rainy day) which is probably not likely. When making compost I usually wet my brown compost before I add it to the bin instead of in the bin where I may increase the chance of over-watering and make the pile soggy, and we don't want to end up with a slimy soggy mess. If you accidently over-water, you can rectify the situation by adding more brown material to absorb the extra water. However, as the days get hotter even green organic material begin to dry out and you will eventually have to add water to your bin. When this time arrives, remember each layer should only be as moist as a wrung-out sponge. Another little trick you can use when watering is remove a handful of organic material and squeeze in a ball. When you release the ball of compost it should clump together with a few drops of water dripping through your fingers. In other words it should be damp to the touch. To sum up in a sentence, during dry periods add a little water or soak your brown material before placing in your compost bin. Now we have met all four requirements. However, the above statement is worth repeating again. For compost to breakdown and give us the desired result, four things must happen. The compost must need moisture, bacteria, air (which gives it oxygen), and of course organic matter (rich in nitrogen and carbon). Okay, great! I'm sure by now we all have a good understanding what we need to do when making compost. As you ad layer after layer, don't squash the material down to make more room, this will result in depletion of air the microbes need to produce good compost and you will end up with smelly compost. Another point worth noting when making compost is that your compost will shrink in the bin as the decomposing process break down the organic material. Just keep adding more organic compost material. You can tell when your compost pile is done or ready to use because the compost becomes dark, brown, crumbly, and somewhat fluffy when squeezed, giving of a rather earthy odor. At this point the original organic matter should no longer be recognizable except perhaps for some woody pieces that didn't quite break down. You will also notice the temperature of the finished compost when touched should be the same as the outside air. Here's a note for the beginner gardening novice. You may see earthworms, centipedes, sow bugs, beetles, snails, slugs, and spiders, in your compost. Do not go Yuk! This is not a bad thing. These are friendly critters and are there to make your compost great and are part of the normal process of compost completion. It is a good idea to let your finished compost sit for two or three weeks to make sure the decomposition has stabilized. As you can see, making compost is really not that difficult and you now have rich organic compost that has numerous benefits for your vegetable garden. Compost improves the soil texture enriching the soil with nitrogen, phosphorous, potassium, manganese, copper, iron, and zinc. As such, your compost retains rich nutrients, moisture, and air that your plants require. Not only does compost benefit your garden soil, it can also be used for your raised bed garden, vertical gardening, or any pot you use for planting vegetables. For additional information on other uses of compost click on compost tea a great fertilizer. Develop a habit of saving your organic material for your compost bin. You will reap the benefit as will your vegetable plants.